Pupus are a small hand-held appetizer of Hawaiian or Asian origin. Make it easy on yourself and delish for your guests. Pre-planning and bit of prep can smooth happy hour. 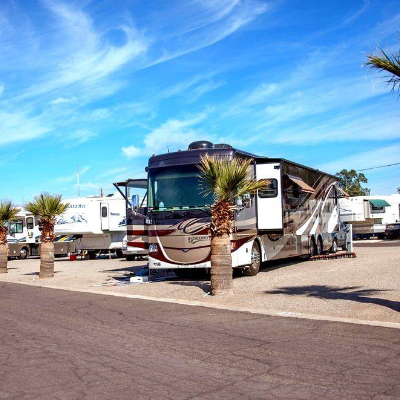 Any hour camping is happy, but the hours of 3 to 5 in the afternoon are happiest––our unofficial happy hour. I propose we have a snack and a cool drink. Go ahead pull a tab, twist a cap, pop a cork or even dunk your canteen in a glacial stream and join me for Pupus at the picnic table. According to Merriam-Webster’s online dictionary, pupus are a small hand-held appetizer of Hawaiian or Asian origin. Pupus are just one way Hawaiians spread aloha. And we are going to do this the easy way. Make some quick pickles for the table a day or two before camping, and some laser-focused shopping will get you in the pupu zone. I am normally the guy to make everything from scratch, but sometimes you need a day off. There is no shame in picking up a supermarket roast chicken and some sides for a week-night dinner. Why not buy a barbecued duck from the local Asian market or barbecue house? While you’re at it, pick up some cooked ribs and this list of ingredients. Let’s keep happy hour simple. 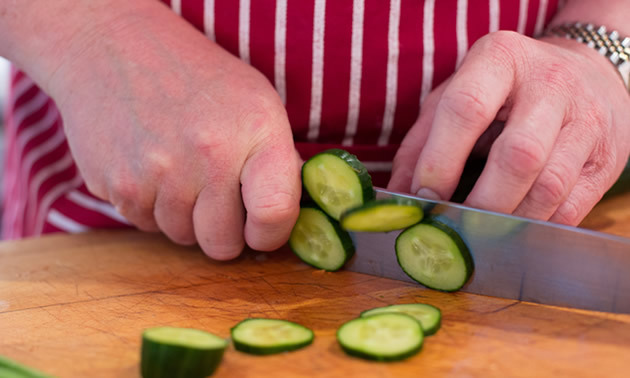 A day or two before you head out, start the fresh pickles. These are crazy-simple to make and are ready to eat after an overnight in the fridge. 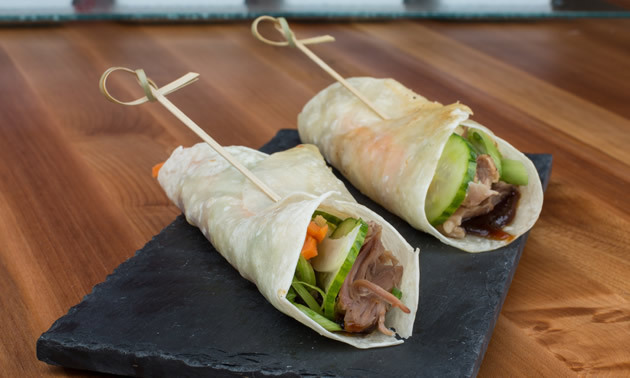 They make a great garnish and add crunch to the wraps, and colour and flavour to a pupu platter. If they do survive the camping trip uneaten, they are good in the fridge for a couple of weeks. When the pickles are gone, the brine can be used again for a fresh batch of veggie pickles. Pour boiling water over salt and sugar; stir until dissolved. Add vinegar and cool the brine. Wash and dry 1-pint (half-litre) containers for your vegetables. Cut the vegetables and stuff in the containers to nearly the top. Pour chilled brine over the vegetables. Use brine as needed, replenishing to meet demand. Fresh fennel. Cut off the green stalks and reserve for another use. Cut the bulb lengthwise in half, and half again. Remove the solid core and slice on the bias, 3/4-inch thick (a Loonie thickness) or finer. Carrots. Peel and slice into matchsticks or coins, as fine as you can. English cucumbers. Wash and cut coins like the fennel. These pickles are raw. Keep them in the fridge for a couple of weeks. They are ready to eat immediately but are best after two or three days. Some will call this cheating—I call it taking a day off. Cut the meat off the duck. (Reserve the bones to make soup if you like.) It’s fine to substitute pulled pork if you are not a duck fan. Warm pancakes or tortillas in a cast-iron frying pan over a medium flame. Add a swipe of hoisin sauce with the back of a spoon to the centre of the pancake. 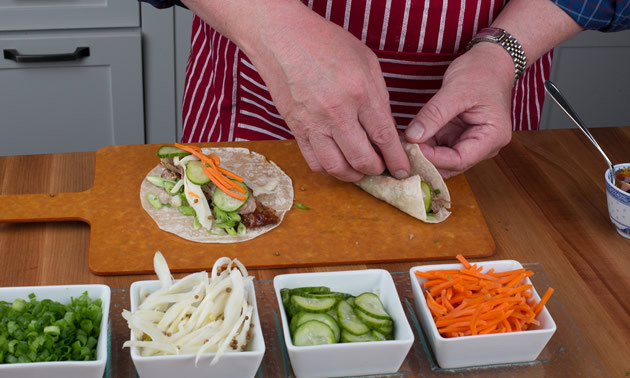 Add duck slices (or shredded pork), pickled cucumber, fennel and shredded carrot. To make pot stickers and onion cakes, follow the package instructions and serve with soy and chili sauces. Arrange these on a platter or cutting board with an assortment of veggie pickles, and join your family and friends at the picnic table for pupus! 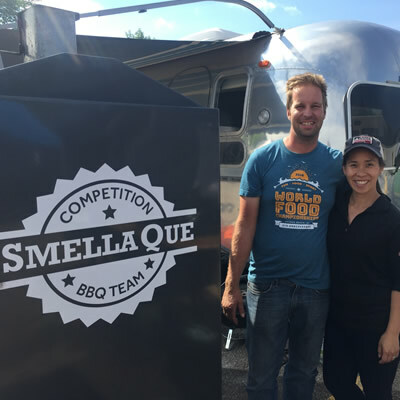 Food, travel and hobby came together for Russell and Janice Smella like a chicken and ribs and cornbread combo. 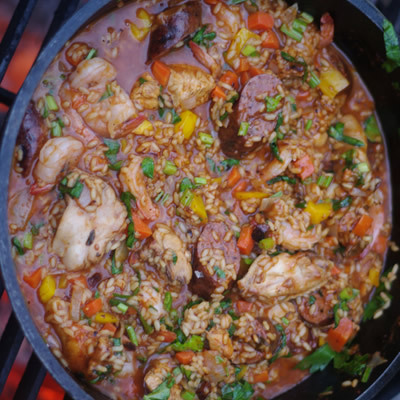 Jambalaya is what happened to Spanish Paella after emigrating to North America.